The former Glenwood Elementary School located along the busy Peach Street corridor in Erie was rebuilt as the new Erie Federal Credit Union corporate headquarters and branch. The large building, about 50,000 square feet, has given the credit union room to grow. The need to reinvent and modernize the space created some design challenges, including the creation of a single main entryway that would both successfully capture the company’s professional image and serve as a parking area. Dahlkemper Landscape Architects worked closely with the credit union at their new home to assist with site planning, grading, installation of planting features, and much more. The property has been revitalized to include an enclosed outdoor space for employees featuring unique metal seating areas and complementary green accents along the ornamental fencing. 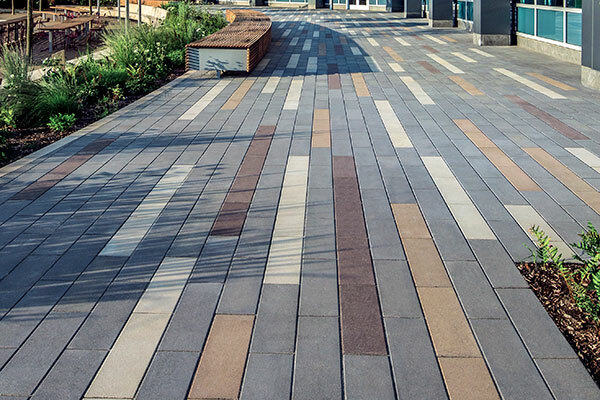 The artistic paving combination of PromenadeTM Plank Paver and Il Campo® in Coffee Creek create a striking visual effect of the irregular etched lines and linear shapes accentuating the building’s contemporary brick and glass architecture. The overall appeal of the development enhances and demonstrates the company’s strong commitment to the city.